I think this might just be my ideal lounge. The mix of stripes, brights and vintage furniture underneath that dramatically high ceiling and rustic exposed bricks has my heart racing! It looks like one of those rooms that would be gloriously bright and airy in the summer months, then cosy and welcoming when it became colder outside. In fact, the whole house is pretty wonderful - see more of it here. What do you like about this space? LOVE this room too. I love how many different styles are mixed together, but with a similar color palette it looks very cohesive. Absolutely love this! The entire place has such great bones! Oh, where to start. I'm looking at my brick fireplace and now want to paint it white. Love these white walls! The light fixtures, striped settee, and the framed prints on the wall are all beautiful. Love. This. Room. I hear ya, brotha! This is my ideal home too. I love that the brick walls are painted white so it lightens up the space while still having the brick texture. I love the floral sofa mixed in and the nice punch of red. YES to everything. 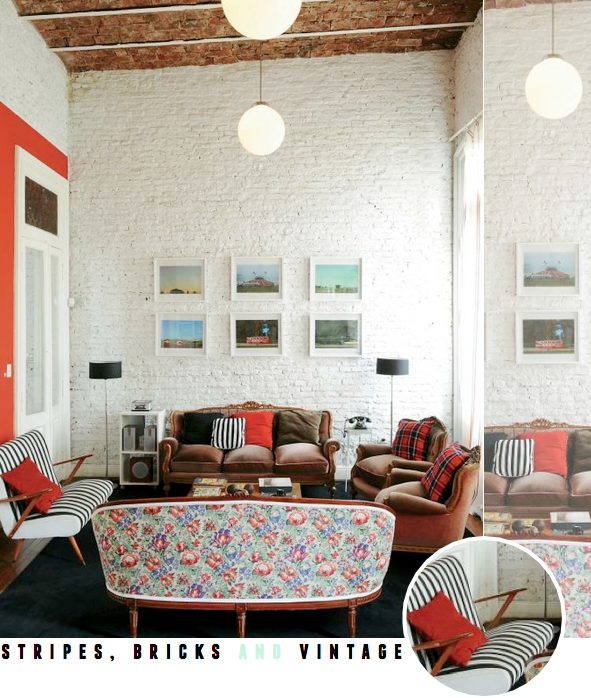 My eye was drawn strait to that awesome striped settee, love the walls and the high ceiling. wow wow wow - love the white bricks! Love the mix of fabrics and the different styles of furniture, they got it spot on! what a great space! they managed to make it warm and inviting with all that white brick. Buenos aires is one of my fave cities lots of cool design coming out of there. Wow what a find!! I love the dark floor and white exposed bricks combo, an incredible room architecturally - light and airy with super high ceilings. Regarding the decor, I think the stripes and red go really well and I love the lighting but... sorry but there is a but... I'm really not too keen on the brown sofa (doesn't it look a bit run down or is that my imagination?) and the flowery sofa is simply too vintage for my taste! Love this space so much! I am a sucker for any room with red! I am in love with that striped settee! So Vienna Session meets Danish modern!! Hi, there is a Scandinavian decorating book up for grabs over at the Northern Light blog, thought you and your readers may be interested! Ohmigoodness, those stripe chairs are amazing. I am loving stripes right now. Stripes, bricks and vintage? What more can you ask for? ;) Love it! ps: it's your birthday next week? I love birthdays! Any plans for celebration? so much to love but that brick ceiling is pretty spectacular. love all the contrasts. great room, will! Oh wow - this place is pretty much perfect! Great prints on the wall. Good find, Will! I love the unexpected combination of textiles... and the exposed brick and tall ceilings, of course!